ADX is an indicator of trend strength in a series of prices. It is composed of two other indicators, the positive directional movement indicator (+DMI) and the negative directional movement indicator (-DMI). The ADX combines and smoothes these indicators. Developed by J. Welles Wilder in 1978. -DMI and +DMI are calculated by comparing the difference between two consecutive lows and the difference between two consecutive highs. A negative value is a zero entry. The ADX default setting is 14 bars, although other time periods can be used as well. ADX is plotted below the price chart and the values range from 0 to 100. ADX values help traders confirm the trend and even better, to identify strongly trending markets. A value greater than 50 signifies a very strong trend and the closer the value is to 100, the stronger the trend. A value between 0 to 20 signifies a weak or non-existent trend. A value between 25 to 50 indicates a strong trend. Traders look for readings above 25 to confirm getting into the trend, whether bullish or bearish and avoid trend trades with readings below 20. Traders use the ADX indicators to recognize trends, corrections and reversals. The indicator tells you whether the market is trending and how strong the trend is. When the ADX line is steep and rising, the trend is strong and strength is increasing. As soon as the ADX line reverses and falls, it just means that the trend strength is weakening but it doesn’t say anything about a trend reversal. The ADX also shows divergence which can be a sign of a weakening trend. When price makes a higher high and the ADX makes a lower high, this is called divergence with declining momentum. Traders can get forewarned about an imminent market reversal. The ADX also confirms retracements when price is moving higher and the ADX retraces with price. In the USD/CAD 4-Hour chart example above, one sees a clean upward swing move followed by a downward swing move. For the uptrend move, the +DMI is above the -DMI indicating an uptrend with prices moving higher. Notice when the red -DMI crosses above the green +DMI, signaling a change in trend from up to down, and when the green crosses above the red, signaling a change in trend from down to up. In between the dotted vertical lines, the +DMI is above the -DMI and the market is in an uptrend. The dotted lines signal a change in trend when the DMI’s cross one another. 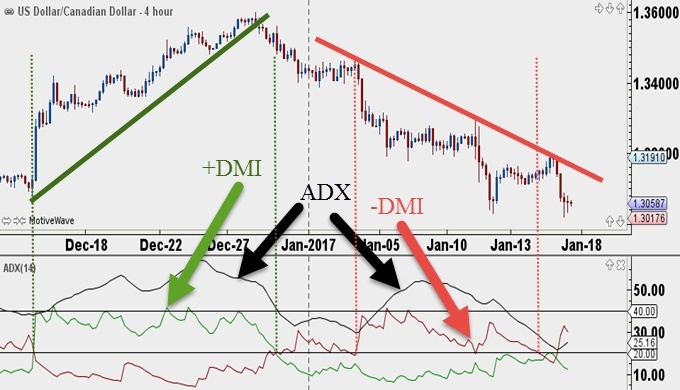 Using the ADX suite of indicators provides a decent determination of trend direction and strength and when used in combination with candlestick and price patterns, can form the basis of a trading strategy to trade the various market cycles. This entry was posted in Trading Tips and tagged adx, adx indicator, indicator, strategies, trading.